1994: Bsc Hons: Management and Systems Science, City University, London. De Montfort University, Leicester, UK. 2003: Dasam Granth: There is no Debate, Published in Sant Sipahi, January 2008. 2007: Appointed Content Editor, www.Punjabheritage.org. Part of the UKPHA (United Kingdom Punjab Heritage Association) projects. August 2007-Sept 2009. Creating, sourcing, editing, content for news stories for the website. 2007: The Akali Nihangs, Book Review, The Beloved Forces of the Guru, Punjab Heritage News, August 2007. 2007: A Book Review Guru Arjun Dev, Guru Arjun Dev, Punjab Heritage News, October 2007. 2008: Descriptions of the Dasam Granth from the “Sketch of the Sikhs” in view of Sikh History, Sant Sipahi, April 2008. 2008: Sri Takhat Harimandir Sahib Patna Sahib: A perspective of its History and Maryada, Sant Sipahi, September, 2008. 2008: Sri Dasam Granth path-bodh Samagam ends at Hazur Sahib, Press release from www.sridasamgranth.com, 27th October 2008. 2008: Sri Guru Granth Sahib - A development in Gurmukhi Presentation, Created with Amandeep Madra (UKPHA). The Living Guru - The Holy Sikh Scriptures Exhibition, New Walk Museum & Art Gallery, Leicester. September-December 2008. New Walk Museum & Art Gallery, Leicester. 4th November, 2008. 2008: The Sikh Manuscript tradition and the destruction of Heritage, Sant Sipahi, December, 2008. 2009: Lecture and Q and A session. Introduction to Sikhism, Leicester Interfaith Fellowship Forum, February 2009. 2009: A historical analysis of the combined recensions of the Guru Granth Sahib and the Sri Dasam Granth, www.Sikhnet.com, May 2009. 2010: Historical sources of the Guru Granth Sahib and the Sri Dasam Granth, Sant Siphai, March, 2010. 2010: The Relationship between Sri Dasam Granth and Bachitra Natak Granth, Sant Sipahi, June, 2010. 2010: Sri Dasam Granth – A Martial Sikh Scripture. Reflections from Sikhan Di Bhagatmala, Sant Siphai, September, 2010. 2010: Heritage Projects Director: Panjab Cultural Assocation (PCA). 2011: The Valiant Ones: A journey into the mesmerizing world of the Sikhs. A book review. 2011. The release of www.gsmann.com: My personal blog. 2011: D Day: The Turban of the Sikhs, Project for Panjab Cultural Association. 2011: The introduction of the Dr Leyden project at Wolfson College, University of Oxford. October 2011. 2011: Interview with BBC Asian Network with Gurpreet Santini: Sri Dasam Granth Q and A book. 23rd November 2011. 2011: Sikh Welfare and Culture Society: Guru Nanak Annual Lecture, County Hall , Leicestershire.Talk and presentation of Sri Dasam Granth Sahib: Q and A Books presented to the High Sherrif of Leicester: Resham Singh Sandhu MBE. The Chairman of County Council: Jackie Dickinson: and to Sir Mota Singh QC. 2011. Panjab Cultural Association Presents: The Lost British Accounts of Sikh Texts: lecture: Guru Nanak Gurdwara, Holy Bones, Leicester. November 2011. 2012: The traditional view about the Sri Dasam Granth Sahib –‘The Global Vision of Guru Gobind Singh that is’, Gurinder Singh Mann and Kamalroop Singh, www.sridasamgranth.com. 2012: Introduction to Guru Granth Sahib Restoration Project at Sikh Lobby Group meeting. Guru Panth Parkash Gurdwara, 19 Ashford Road Leicester LE2 6AA. 1st April 2012. 2012: Discussion with Rajinder Singh on THE SIKH CHANNEL: 'The British and the Sikhs'. May 2012. 2012: British and the Sikhs: The Impact and Legacy of Colonial Dominance in the Punjab. The Punjab Research Group at University of Wolverhampton, UK: 4/11/2012. 2013: Takht Hazur Sahib presentation: At the Sikhi Classes, Guru Nanak Gurdwara, Holy Bones, Leicester, 08/06/2013. 2013: Understanding the Dasam Granth Debate in the UK: Responses by Sikh Youth from the Internet to the Gurdwara, Sikhs In Europe Conference, Lund University, Sweden. Acted as a critical friend to another paper delivered at the conference. 2014: Co-convenor, Panel Chair and delivery of a paper. The Importance of Sikh Relics and Manuscripts in the UK at International Sikh Research Conference, University of Warwick, Coventry, CV4 7AL. 2014: Warrior Sikhs: The Akali Nihangs Lecture at Sikh Fortress Turban Exhibition, New Walk Museum & Art Gallery, Leicester, Sunday 13 July 2014. 2014: Dasam Granth: A historical perspective of the Khalsa from Eighteenth Century texts paper delivered at Sikh Studies Conference 2014, Imperial College,South Kensington, London. 2nd August 2014. 2014: Introduction to Anandpur Sahib at Relevance of Sri Anandpur Sahib to the Sikh faith. Organised by the Anandpur Sahib Heritage Foundation. At Nehru Centre, London, 5th September 2014. 2015: Director of The Sikh Museum Initiative (SMI). 2015: Sikh Artifacts and Relics in the UK. Organised by the Department of Encylopaedia of Sikhism, Punjabi University Patiala, Punjab, India. 2015: Sikh Museum Initiative: Documenting Sikh Relics and Artefacts in the UK, International Sikh Research Conference, University of Warwick, June 28th 2015. 2015: Sikh Museum Initiative: The Treasuries of Sikh Relics and Artefacts: From the Past to the Technological Future with Taranjit Singh. Sikh Studies Conference,Imperial College, London. August 1st 2015. 2015: Sikh Army Identity in World War 1,Part of the Panel: Alternative Stories from the trenches:Commemorations of Indian soldiers in World War, Concurrences in Postcolonial Research- Perspectives, Methodologies, Engagements Linnaeus University, Kalmar, Sweden, 20-23 August 2015. 2016: Sikh Relics and Artefacts in the UK, at the University Of Leicester in conjunction with the University of Leicester Sikh Society and the Sikh Museum Initiative. 2016: Anglo Sikh Wars, Battles, Treaties and Relics project at the International Sikh Research Conference, June 2016 , University of Warwick. 2016: The technological revolution in promoting Sikh arts at the British Association for the Society of Religions Conference (BASR) 2016, University of Wolverhampton. 2016: Sikh Museum Initiative on the Akaal Channel. 2016: Project and website launch of Anglo Sikh Wars: Battles, Treaties and Relics at Newarke houses Museum, Leicester , 14th October 2016. 2017: Anglo Sikh Wars pop up exhibition June to October 2017. 2017: Anglo-Sikh Wars; a Journey into Sikh Relics and Artefacts in the UK Lecture at Orders and Medals Society(ORMS) 2017, Stratford Upon Avon. 16th September 2017. 2017: Appearance on BBC Celebrity Antiques Roadtrip, Broadcast on 13/12/2017. 2018: World War 1 Lecture as part of the Metro Boulot Dodo (MBD) project on Indian Soldiers in the Great War. 2018: International Woman's Day, Royal Bank of Scotland, London. 2011: In conjunction with the Punjab Cultural Association: Dr Leyden's Panjabi Translations, Archimedes Press, 2011. 2014: ' Degh, Tegh, Fateh', Hindi translation in Dr Shobha Kaur(edited), Sanksriti Niyanta. 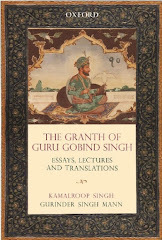 2015: The Granth of Guru Gobind Singh: Essays, Lectures and translations, Delhi: Oxford University Press. 17 years of research at various libraries and museums and private collections in the UK and abroad. Including British Library, Welcome Trust, British Museum, Khalsa College Amritsar, Punjabi University Patiala, and various Gurdwaras and Sikh thrones of Polity (Takhts ). Advisor to New Walk Museum, Leicester City. Research and manuscript preparation for UKPHA in the digitization and preparation of the Sikh and Punjabi Manuscripts project. Advisor to Just War Theory Project, Royal Military College, Ontario, Canada and Department and Centre for the Study of Religion,University of Toronto. Supporting undergraduates and postgraduates on Sikh MA, MPhil and PHD Courses, worldwide. Resource material created and used by various Sikh temples in the UK, USA, and Canada etc. 2007: Research material and consultation to the late Dr W.H.McLeod for his revised dating on the Prem Sumarag Granth: Reflections on Prem Sumarag, Journal of Punjab Studies, vol 14, Number 1, Spring (2007). 2009: In the Master's Presence: The Sikhs of Hazoor Sahib, vol 1, Nidar Singh Nihang and Parmjit Singh, London: Kashi House. 2013: The Sikh Ẓafar-nāmah of Guru Gobind Singh: A Discursive Blade in the Heart of the Mughal Empire, Louis E. Fenech, USA: OUP.